The Belgian rider broke away on a long uphill and finished well ahead of the rest of the competitors. Tim Wellens triumphed on stage six of the Giro d'Italia on Thursday, while Tom Dumoulin added some valuable seconds to his general classification lead. The victory was Wellens' first on a grand tour and made it back-to-back stage wins for Lotto-Soudal following Andre Greipel's first-placed finish on Wednesday. Wellens moved away from the peloton to join the breakaway trio midway through the 157-kilometre race, before launching an attack and crossing the first summit finish of the tour with a comfortable advantage. It was a tactic followed by Giant-Alpecin rider Dumoulin, who, despite missing out on bonus seconds with a top-three finish, increased his advantage to 26 seconds in the race for the pink jersey. After a number of failed breakaway attempts in wet conditions early on, Alexandr Kolobnev (Gazprom-Rusvelo), Alessandro Bisolti (Nippo-Vini Fantini) and Eugert Zhupa (Wilier Triestina-Southeast) surged away from the pack. The trio took a six-minute lead into the first climb, but Kolobnev was caught by the peloton on the technical descent as the rain began to fall once more. Bisolti had taken charge of the leading pack during the climb, but the gap he and Zhupa held had been severely reduced, and they were not on their own for much longer. Wellens was joined by team-mate Pim Ligthart and Laurent Didier (Trek-Segafredo) in leaving the bunch to join the break, and the group of five opened up an advantage in excess of eight minutes. In the final climb, the Belgian caught Didier's charge with 15km remaining and never looked back from there. Pre-event favourite Vincenzo Nibali made a break for the line in the closing stages, but he was caught by Dumoulin, though Jakob Fuglsang (Astana) and Ilnur Zakarin (Katusha) beat him to the podium. 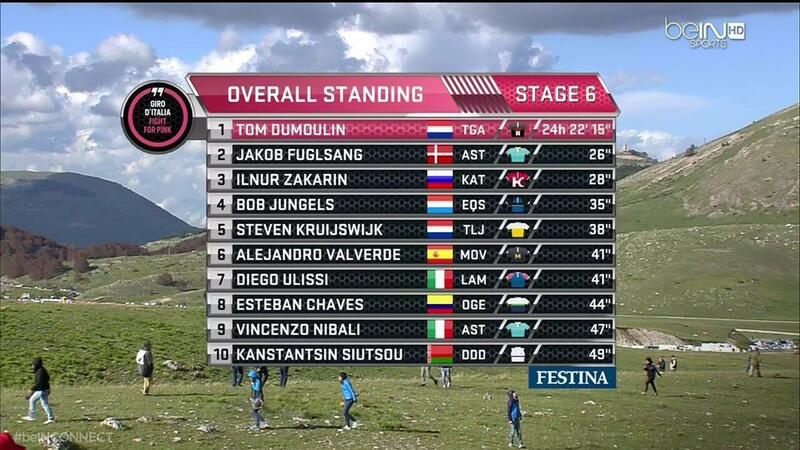 Here is the overall table after Stage 6. Previous When Will Giro d'Italia Favorites Make Their Move?